Harp guitar fans should be very familiar with this beast. It was owned by the late Scott Chinery and included in his 1996 book with Tony Bacon, The Chinery Collection, 150 Years of American Guitars (from which I am respectfully borrowing these images). The book is a must have, and was later reprinted (with Chinery's name largely absent) as The History of the American Guitar. Now remaindered, you should pick up a copy while you can! Although c.1910 was given as a date for this instrument (not impossible), I suspect it more likely coincided with the final patent date, thus c.1915. 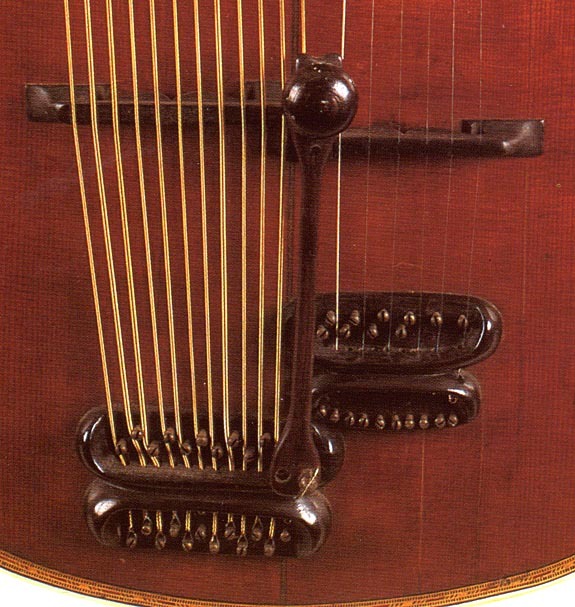 Mr. Chinery's various harp guitars are all featured on this page. This particular guitar was sold recently to persons unknown. 1,128,217b 1,128,217c Scott wrote of this guitar, "I often think it looks almost like a Gothic torture device." I have to agree! And yet, there is a very thorough logic to Mr. Bohmann's ultimate creation - in fact, nearly every feature was important enough that he patented it. Bohmann had earlier patents (including a strange hand rest for bowlback mandolins in 1889), but the first one to concern us is # 1,128,217. Applied for on Oct 28, 1911, it wasn't granted until 3-1/2 years later, on Feb 9, 1915. The two key "improvements" it offered were a set of sympathetic "strings" inside the body, and bulging convex top and back. For the former, Bohmann attached thin metal rods inside the instrument from the neck block to the end block. 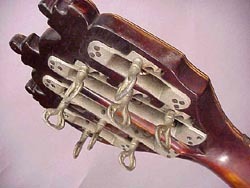 These were then tuned, via wing nuts, to specific pitches, in order to vibrate in sympathy when played. He even figured out the best materials to use - copper for G, brass for D, steel for C, and German silver for F (what else?!). There was also a damper pad which could be locked into place or left free by depressing a button next to the fingerboard. 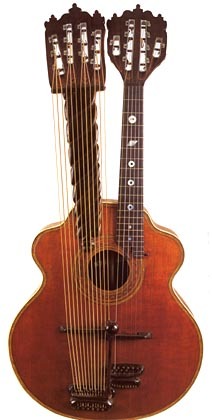 Four of these were specified in the patent, but up to seven were used in the harp guitars. 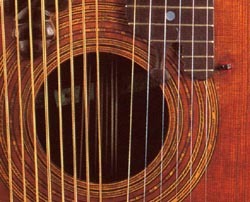 You can count the seven rods through the soundhole of Chinery's instrument at left, and also see the damper pad, with the activating button coming through the top to the right of the fingerboard. Scott said in his book that he heard little difference between the damper On and Off positions - it seems like a lot of work for such negligible effect! The second part of the patent addressed the new construction: side walls which were 1/4" thick, with the top and back assembled last, bowed under extreme tension. 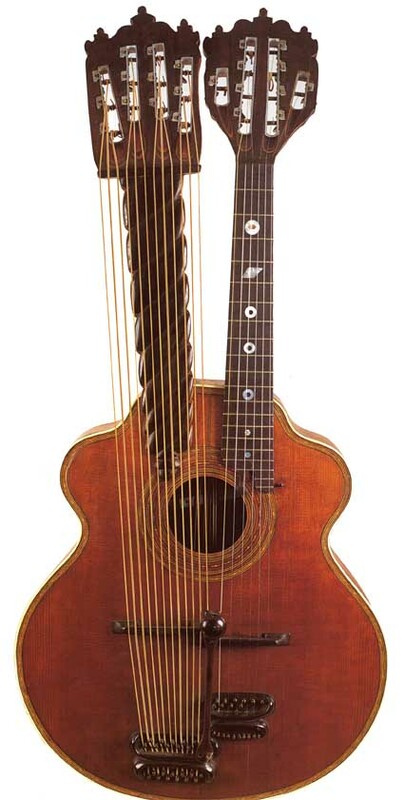 Both concepts were to be applied to "A-shape" mandolins, guitars and "harps" (harp guitars). On March 9 of 1914, Bohmann applied for a patent on his new hand rest. This appears never to have been granted, probably as it was redundant - as it was also included on the next patent he submitted four months later on July 27. You can see it clearly in the patent below, and the three known harp guitars all have basically the exact same device. Frank Ford mentioned how fragile the one he inspected looked, doubting that it could have been used as a hand rest - yet, amazingly, these wooden attachments are still intact on all three harp guitars! Bohmann mentions a "patent machine bridge" in his 1899 catalog. 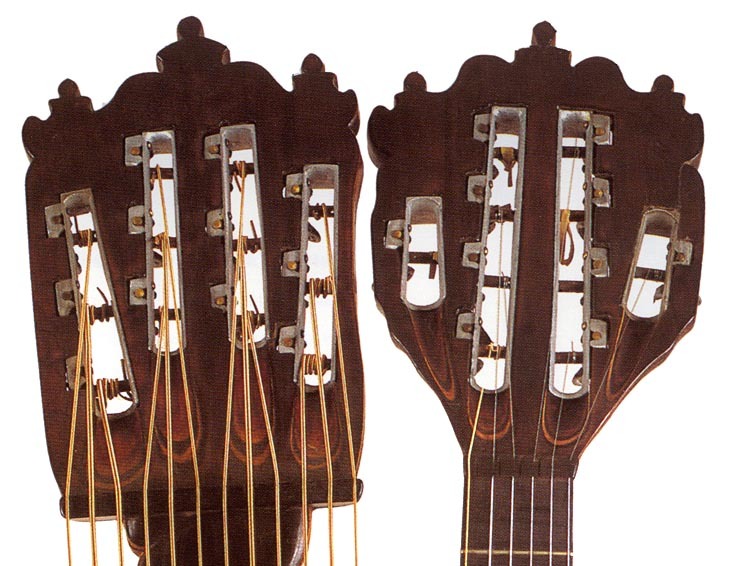 If pictured on his instruments, it appears to be simpler than the complex "double bridges" of these later instruments. The top set of screws seem to be "guideposts," the strings then going underneath through holes into a second section. A second set of screws here are used to attach the loop-end strings. 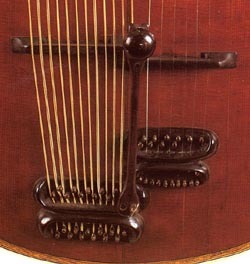 Note that it is strung with ball-end strings, which are hidden under the lip. 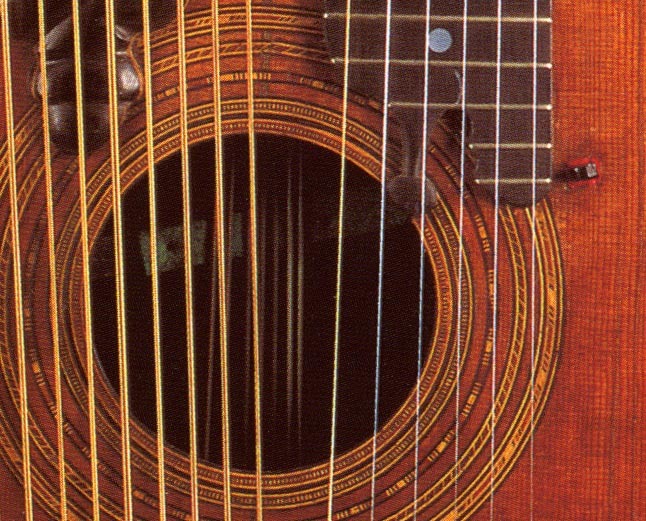 Though only six strings have been strung on the main neck, there are ten screws - it seems this is a 10-string, 6-course instrument, the low four courses meant to be doubled! Patent # 1,179,499 was granted two years after filing, on April 18, 1916. Besides the discussion of the separately-applied for hand rest, this patent included the new body shape - a strange upper bout intended to make it easier to access the higher frets (conveniently shown with the illustration of the added hand!). The convex top and back construction is again discussed, this time with new special bracing (luthier's take note!). Not mentioned in any patent (that I can find) are the bizarre tuners in an even stranger headstock design that helps bring to mind the "torture device." At right, Frank Ford provides a better view of these amazing custom tuners on a similar instrument. 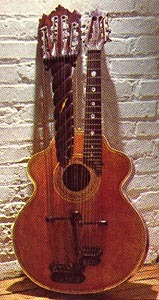 The other two similar period Bohmann harp guitars known to me are the 7-strings-on-the-neck, 12-sub-bass version from Tom Wheeler's American Guitars, and the 8-string (2 off-the-neck) presented on Frank Ford's Frets.com. See more Bohmann designs on The Harp Guitars of Joseph Bohmann!